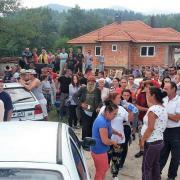 Vjosa and Valbona receive prominent support! “Blessed be the free rivers" (“Lum Lumi i Lirë“!) 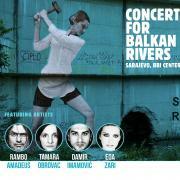 aims to give a voice to the threatened rivers Vjosa and Valbona and create a deep echo of awareness in the public. Eda Zari, Elina Duni, Linda Rukaj, Rhani Krija (Official), Vlashent Sata, Emiljan Dhimo, Shpat Deda, Gert Kapo, Henning Jung, Kleidi Eski, Sokol Çunga, Mikaela Minga collaborated to produced this amazing song and video. 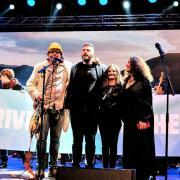 ++ Rambo Amadeus, Eda Zari, Damir Imamovic and Tamara Obrovac sing to stop the hydropower tsunami on the Balkans ++ Hundreds of people raised their voices at the open-air Concert for Balkan Rivers at Sarajevo’s BBI centre on Saturday, September 29th. They were singing along with the popular musicians and thus raising awareness for the massive destruction of rivers which is going on all over the Balkan peninsula. 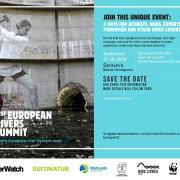 Join us at the first European River Summit, which will be held in Sarajevo from September 27-29! REGISTER NOW! 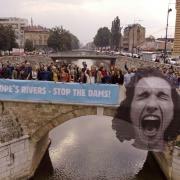 To do so send an email to cornelia.wieser@riverwatch.eu, including your name, organisation, country and the subject line “European River Summit” by AUGUST 31. 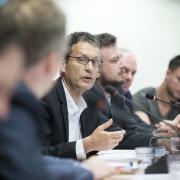 On Wednesday 27 June, a Save the Blue Heart of Europe debate and film screening was held at the EU Parliament, to an audience of policymakers, media and NGOs. The issue of protecting the Balkan Rivers from the threat of 3,000 proposed HPPs was debated, along with the question: What role can the EU play to ensure a win-win scenario by safeguarding nature and leading the region’s low-carbon future? 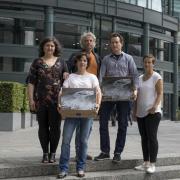 Yesterday, representatives of the Save the Blue Heart of Europe campaign to save Europe’s last remaining wild rivers hand-delivered a petition endorsed globally by more than 120,000 people to high level executives at the London headquarters of the European Bank for Reconstruction and Development (EBRD). ++ Representatives of the Bern Convention emphasize the conservation value of the river ++ Albanian Government signs concession contracts for HPP Kalivac nevertheless ++ Representatives of the Bern Convention visited the Vjosa in order to investigate to which extent plans for hydropower development are jeopardizing the objectives of the Bern Convention. The on-the-spot appraisal was accompanied by an independent expert.